Well, the college bowl bonanza is in full swing. Wow! Most of the games have been very exciting. Only a handful of games have been blow-outs (USC beat the bejeebers out the the Nits–Fight on!) and a couple have actually gone to over-time. What a game! UNC has a very good team and an incredible wide receiver named Hakeem Nicks who made several fantastic catches and was a one-man highlight reel. But Pat White, WVU’s outstanding quarterback, was even better, completing 26 of 32 passes for 322 yards and 3 touchdowns and racking up 55 yards on the ground. 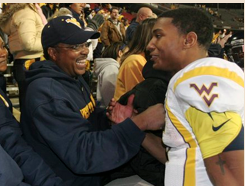 He ended his four spectacular years at WVU as the NCAA’s all-time leader in rushing yards for a quarterback and is the only quarterback in college football history to start in and win four bowl games. Thank you, Pat White, for four wonderful years of exciting football. BTW, that’s Pat and his father in the picture. I should mention here that Pat White is as exemplary off the field as on it and received his degree at the December graduation. Oh, and he has a younger brother, Coley, who is also a quarterback, and who is now a student at WVU. Pat will be a tough act to follow, but Coley is a very talented prospect. Time will tell. I finished my “White Gansey” and dug out a UFO, Alice Starmore’s Kinsale. Sometimes when you pick up a project that you haven’t worked on for months, it is difficult to get back into a rhythm. But I got right back into Kinsale with no problem at all. It’s like I never set it aside. On January 15th, I will be starting the Foothill Road Aran as part of the 2009 Aran KAL, so I must refrain from casting on any new projects. I have some lace weight Jojoland Harmony yarn that is calling to me, but so far I have resisted. No new shawls till I finish the edging of my Orkney Pi.